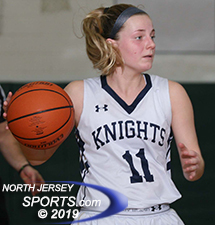 HILLSDALE – Old Tappan junior Hallie Plescia drained both ends of her second try at a one-and-one with 14.8 seconds to go to give the Golden Knights a late four-point lead en route to a 45-41 victory over Ridgewood in the Bergen County Tournament quarterfinals on Saturday afternoon. Plescia turned the first one-and-one she missed into a great play, setting up her final two points of the game. She had gone to the line with 16.2 seconds to go but missed the front end of the one-and-one. She burst forward from the free throw line and grabbed the rebound. Ridgewood had no choice but to foul her again. “She got the rebound off of it and pulled it back,” said Old Tappan coach Brian Dunn. “They were trying to foul her to put her on the line. It’s great when a kid knows it’s coming and they can step up and do it. 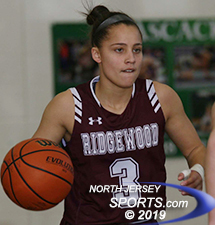 Jackie Wolak scored a team-high 12 points for Ridgewood, the No. 11 seed. The Golden Knights saw a 14-point lead evaporate in the final four minutes of the fourth quarter. Senior defensive star Noelle Gonzalez scored her only points of the game with a three-point play and junior Gianna Saccoccio drove to the basket to give Old Tappan a 43-29 lead with 4:35 to go in the game. Ridgewood called timeout and whatever Maroons coach Karen Keyes said to her team set a fire under them. Senior Jackie Wolak drove and scored and a minute later senior Hagan Gorman cut the Knights lead to 43-34 with a three-point play. Then senior Maddie Sullivan and sophomore Katie McCarthy canned a pair of three-pointers 34 seconds apart. Ridgewood had cut the lead to 43-40 with 1:22 to go in the game. Old Tappan missed a free throw and the ball changed hands a couple of times until the Knights called timeout with 24.5 seconds left in the fourth quarter. The Knights began to foul the Maroons ball handlers until a shooting foul was called and Gorman went to the line to shoot two free throws. She made one of two, which set the stage for Plescia’s game-saving points. Megan Weis and third-seeded Old Tappan will take on No. 2 IHA in the Bergen County Tournament semifinals next weekend. Old Tappan grabbed a 16-9 lead in the first quarter as Saccoccio and senior Jackie Kelly tallied five points apiece and Plescia added four. The team defense was solid and it seemed like the Knights got possession of every loose ball. Dunn appreciated the team’s effort, especially Saccoccio’s. The Old Tappan offense went cold in the second quarter so remained within striking distance. Nevertheless, the Golden Knights took a 23-18 lead into intermission. Maroons senior Annie McCarthy swished a three pointer a minute into the second half to cut the Knights lead to two, 23-21. But Old Tappan went on a 13-2 run over the next 3:43 of the game to boost their lead to 36-23. Weis got it going with a three-point play. Saccoccio followed with a steal and coast-to-coast trip to the basket for a layup. Kelly hit a three and then took a pass from Saccoccio for a drive to the basket. After senior Jackie Wolak, who led the Maroons with 12 points, scored, Kelly drained another three and Ridgewood called timeout, down by 13 points. The Golden Knights move on to play Immaculate Heart Academy in the semifinals next Sunday at Ramapo College.